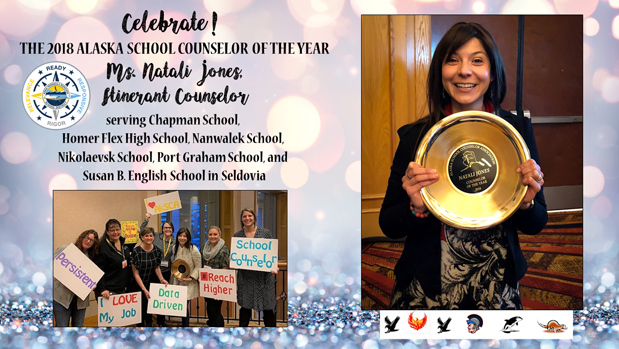 The 2018 Alaska School Counselor of the Year is Ms. Natali Jones, itinerant counselor serving Chapman School Anchor Point Alaska, Homer Flex High School, Nanwalek School, Nikolaevsk School, Port Graham School, and Susan B. English School in Seldovia! 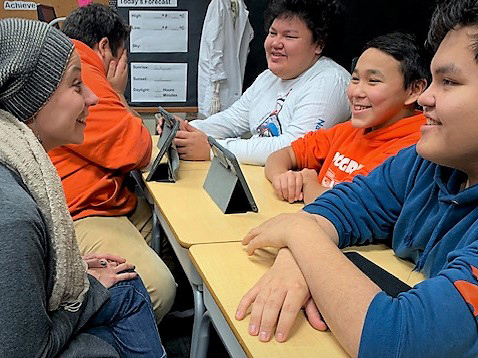 The most moving part of my work is when students seek out their own wellness and post-secondary success. Whether it is sharing a safety concern, or their dream to become the first person in their family to graduate it takes bravery to speak your truth. I know I am in the right place when I hold the belief that anything is possible. I became a school counselor in August 2011. My parents, who spent a great deal of their careers as teachers and passionate about working with youth said they were not surprised by my choice—in fact they had been wondering when it was going to happen. I was a peer counselor in middle school. I later pursued careers in journalism, film, and Human Resources. These all had a common thread: helping people tell their stories and supporting their ambitions. School counseling was a very natural next step. This honor evokes a great deal of gratitude, first to the wonderful students and communities I serve. I have learned such an incredible amount about generosity, dedication, and cultural values. Next to each of those that support my role as school counselor including the incredible teams that make up our schools and a web of support for our students. This includes all employees classified and certified. Without each of these people, I would not be able to do my work. School counselors provide supports with academic, career and social-emotional development. I am impacted by those who support my role and those in our district that understand the challenges of small schools including equity of resources. Hands down working with students is the favorite part of my day. As an itinerant, it sometimes looks a little different. It may be online e-mail correspondence, but the best is sitting with a student and supporting their success. I could not do my work without the support and collaboration of my family, friends, colleagues, students, and communities. Truly wrap around services bolster our youth. Each of my schools has a level of need that could justify a full time school counselor. My hope is that school counselor professionals be viewed as an intricate part of student success and safety. I advocate and wish for a school counselor in each school in our district, state, and nation because together we can create change. I grew up outside of Eugene, Oregon, in the country and went to Harrisburg High School, then graduated with a Bachelor of Arts in Journalism and Spanish (double major) from the University of Oregon. I received Masters of Education in School Counseling from the University of Alaska Fairbanks.